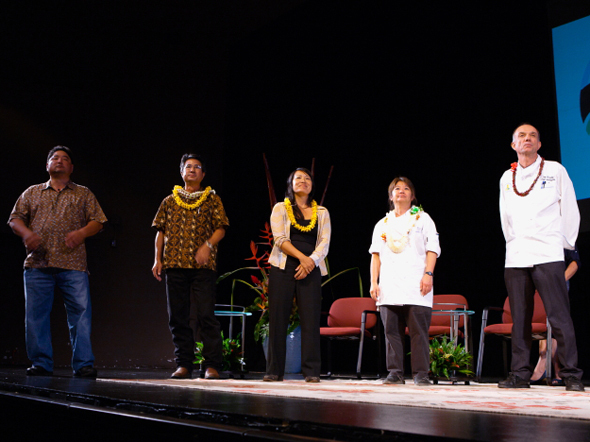 Mahalo to everyone who participated and attended Chefs and Farmers Facing the Future: a Forum on Food. 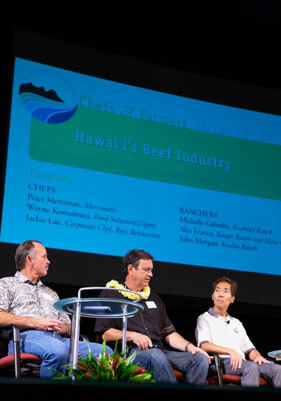 Over 500 people – chefs, culinary students, farmers, ranchers, food purveyors and other industry professionals along with the general public – nearly filled the 570-seat theater. This was the first event of its kind that brought together the food industry professionals under one roof. 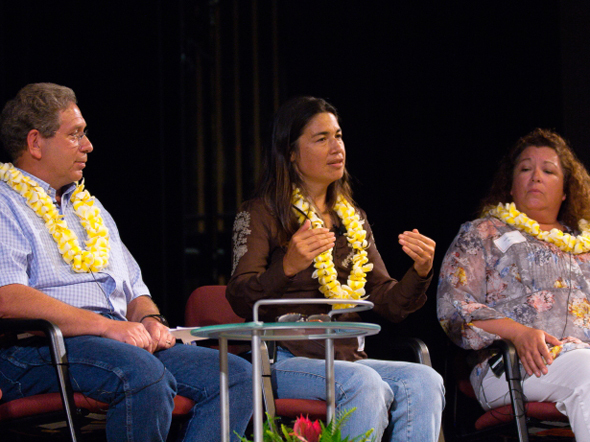 That in itself was a big step forward and we were able to start to conversation on Hawaii’s food security with the people on the frontline of our food system. – Tilapia Demand: Tropic Fish (seafood distributor and processor) has reported an increase in requests being fielded for tilapia from restaurants and other customers. Our tilapia farmers are now ramping-up production to meet the demand. – Beef Demand: Wayne Komamura, Zippy’s R&D Chef is now interested in featuring local beef in their chili program. They are already featuring local beef in the hamburgers, hamburger steak, and local moco, which amounts to roughly 255,000 lbs. annually. Featuring local beef in the chili will be a huge boost to our cattle industry. – Pork Demand: The “Nose-to-Tail” feature story in the Honolulu Star Advertiser that promoted the forum has spurred lasting and substantial interest for local pork. The hog farmer who was featured in the story was having a very difficult year because of the economy but now their production is spoken for. It’s rewarding to know that the market responded and is willing to pay what the farmer needs to remain viable. – Whole Carcass: Chefs like Peter Merriman, Ed Kenney, Alan Wong and now Jim Babian, Executive Chef of the Four Seasons Hualalai are purchasing whole or half carcasses, “nose-to-tail” to help ranchers defray risk. 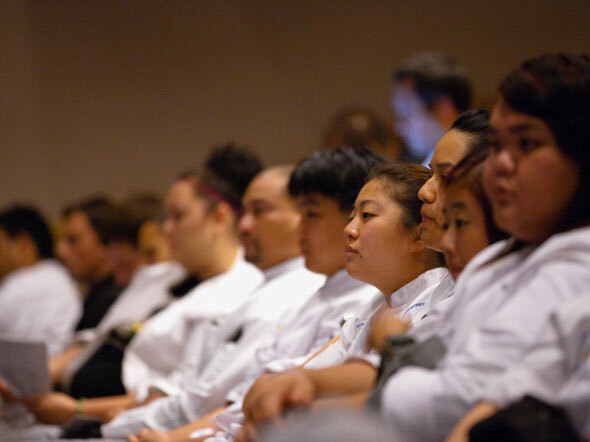 Our hope is that they will lead to way for other chefs to join this culinary movement to build our local food system. – EBT in the Farmers Markets: As one of the managers at the Hawaii Farm Bureau’s farmers markets, Lisa has been working for the past year to integrate EBT/SNAP benefits into the markets. Public support expressed on this issue at the Forum has helped tremendously to accelerate this process! We might be seeing this service available as soon as Fall, if all goes well. Thank you to those of you in attendance who brought this issue up and voiced support – a handful of you who were there and are in key positions to lend official support have really come through. Stay tuned, a forum video is in the works. We have five hours of video from three cameras! We’ll be editing that down to half hour. Or 56 minutes . . .
Aside from the name of your newsletter, She Grows Food… what women are involved? The panel was predominantly men. When I got up to ask questions, I was shushed by Chuck Furuya. What was he trying to do, protect Dean and big ag? Or just keep the Forum on Future as a nicey nicey pat on the back of the 20 year old Hawaiian Regional Cuisine guys… and say let’s buy buy buy…. No, that’s not addressing the Future of Food. Your Forum was a Forum of the Past. 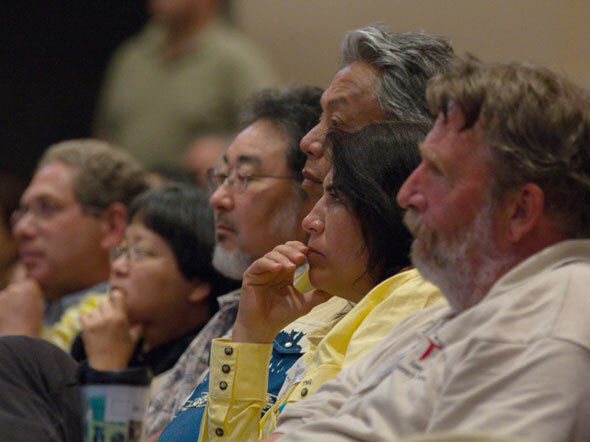 If people can’t have a say about the future of agriculture here on Oahu in your Forum, we’ll find another Forum that will. Sorry to hear your experience at the forum was not a positive one. Thank you for the feedback. Sorry for being so negative. Though I still feel there should be a forum regarding GMOs, I just finished reading Alan Wong’s story in his first cookbook the NEW WAVE LUAU with pictures of him with various farmers at the blessing of their farms before anything was growing; like the Hirabaras. 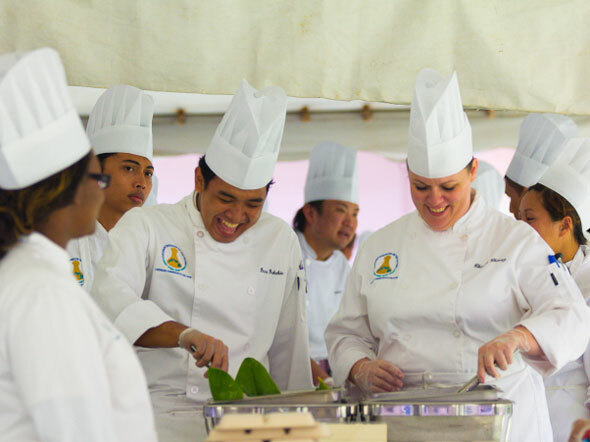 I can see that what the Hawaiian Regional Cuisine chefs did back in the day was not only create a new kind of food, but very importantly made connections to support the farmers. Wish there would have been more organic vegetable farmers highlighted. Not just the cattle and tilapia ones. Who are those 80% women farmers? Where are their farms and how can we access their products? Aloha, an aside you might like to think about…here from the mainland for a wedding and great food! Looking for mention on menus of sustainable fish. None! Looking for Fresh veggies, organically grown, again only one restaurant mentioned the source of their produce. Since I am a FOODIE, formerly worked at Chez Panisse and Stars in the SF Bay area, I always look on the menus for mention of these. I live in Carmel Valley, CA. There the growers, chefs, local newspapers, the AIWF, and many regular folks like my family patronize restaurants who practice what they preach. Are where we spend our food dollars depends on this. While we have the Pebble Beach Wine and Food festival and it is well attended, the focus is only on the food. The focus is not on sustainable or organically It seems to me you are doing a great job,letting the public know what’s fresh, local and sustainably raised. If so, make it shameful to carry the fish which is not okay to eat. You’d be surprised how the public will react. I personally will not eat in restaurants which don’t seem to care where and how their food, produce and meat and fish are raised!! !